Stuttgart/Germany, May 2014 – For their trials in the development of fibre reinforced and additive-enhanced polymers, the compounding experts at PolyOne Europe in Gaggenau/Germany, have ordered the new ZSK 26 Mc18 twin screw extruder from Coperion GmbH, Stuttgart/Germany. 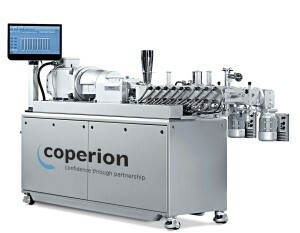 Coperion will be supplying the comprehensively equipped laboratory extruder from start to finish: from the material feeding system (Coperion K-Tron) to the compounding extruder to the pelletizing system (Coperion Pelletizing Technology), thus ensuring optimum compatibility at every stage in the compounding process. What clinched the company’s decision in favour of Coperion was first the positive experience with Coperion technology. Twin screw extruders from Coperion are already in service at several PolyOne production sites. In addition the comprehensive processing know-how and support package offered by Coperion and the high reliability of Coperion’s machines and equipment with the tried and tested wear-resisting solutions they feature, were benefits that could not be matched. For the new laboratory extruder, PolyOne decided in favour of a version with specific wear-resistant barrels and screw elements. The ZSK 26 Mc18, which features a 25 mm screw diameter, has been specially designed for the development of formulations and the production of samples. With output rates of up to 180 kg/hour the extruder is also suitable for the compounding of small batches. The ZSK 26 Mc18 for PolyOne is equipped with a ZS-B side feeder for the introduction of fillers and additives and a ZS-EG side devolatilization, both of which are mounted directly on the side of the machine with the aid of a specially developed swing arm. The laboratory extruder includes four Coperion K-Tron loss-in-weight feeders for solid materials and one liquid loss-in-weight feeder. The loss-in-weight feeders are equipped with patented SFT weighing technology and operate with absolute accuracy thanks to their high speed, high resolution performance (1:4,000,000) with vibration filtering technology. These advantages also benefit the production of relative small batches. Standard drive units provide for absolute reliability with performance ranges (up to 1:100) that are so important for laboratory applications. 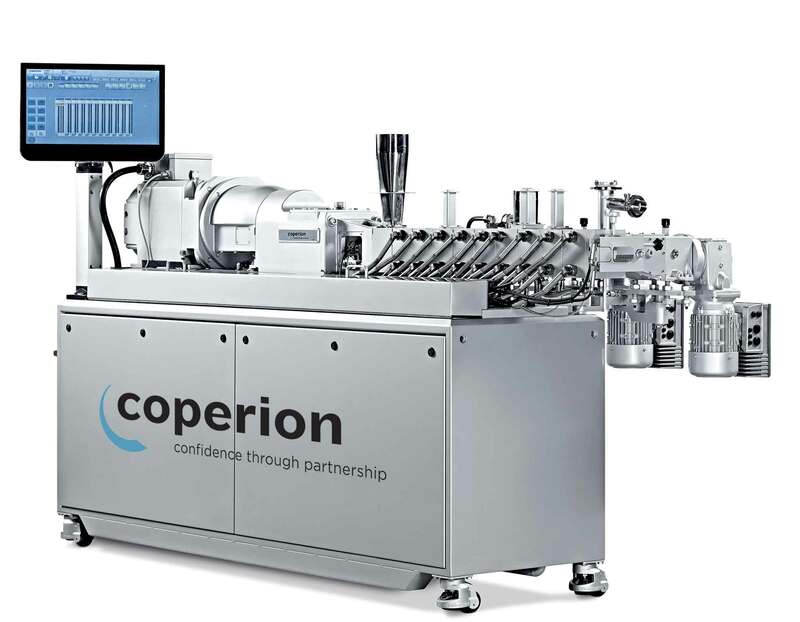 Operation and visualization of the compounding process is accomplished by means of Coperion’s newly developed CSpro extruder control system that also includes central access to all process-relevant data from each loss-in-weight feeder. The pelletizing system is likewise supplied by Coperion (Coperion Pelletizing Technology). It comprises a Type SC80-3.000 strand conveyor (stainless steel version), where the extruded strands can be both water and air cooled, with a Type SD 70 easy suction device and an SP 50 EN strand pelletizer. The new ZSK 26 Mc18 features a torque of 15 Nm/cm³. It is economically very efficient, as its specific energy input is extremely low. Compared with its predecessor, the ZSK 26 Mc, the product handling is much more gentle due the higher filling degree and to the lower melt temperatures. This new laboratory extruder is mobile and requires minimum floor space, as the control cabinet is integrated into the base frame. The heating and cooling systems are installed ready for use (Plug & Play). Also new is the extruder die head, which features an optimized heating system. It can be opened by loosening one screw, enabling easy replacement of the breaker plate or the die plate, for example. PolyOne Corporation (www.polyone.com) is one of the world’s leading manufacturers of customized polymer compounds. With its 35,000 products, 60 production and distribution sites in 20 countries, in North and South America, Europe and Asia, PolyOne serves 10,000 customers worldwide.